For general production factories For quality control For the inner., For general production factories For quality control For the inner. Although it is a work glove, it is actually cotton, no gusset, and good for cospa, and it is very suitable for children's moisture gloves. Useful for school. Alcohol cleaning is a basic practice in schools today. A painful environment for children with skin problems. Even children who are permitted to do alcohol cleaning, drawings (such as paints and paints) wash their hands frequently in various classes and school lives. My child is prescribed a plaster in order to cause rough hands and bleeding from such cleaning. Wear gloves as much as possible after applying the medicine. At that time, it is good to be made of cotton and have no seams as much as possible. Medical and moisturizing gloves (high prices) are used at home, and this item is for school use. If you wear gloves at school, you will get messed up with pencil graphite, dirt on your desk, and mysterious mystery dirt. In particular, the pen and pencil stains can not be removed by washing. If it gets dirty, I use it with the momentum to make it disposable at the child's own discretion. This review is about item#35259734. It is used simultaneously with leather gloves. 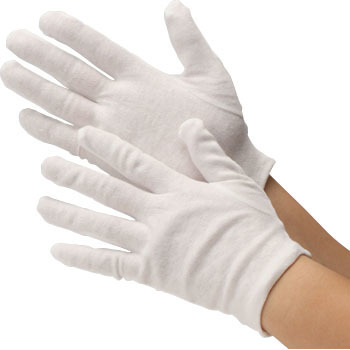 We use cotton gloves because if the leather gloves are bare hands they will be rough. My hands are gone. This review is about item#35259752. Cospa is by far better than buying it elsewhere. There is no problem in use and it is comfortable to use. I felt that it was very easy to use, fitting the hand perfectly. It is useful because it does not get dirty at the time of inspection. Because it is relatively thin, you can work without discomfort even if you touch it with gloves on. As price is reasonable, we purchase in Lipi. This review is about item#35259725. It is cheap, but things are not bad and repeat. Furthermore, we purchase at the time of discount and stock. This review is about item#35259743. Good that can be used to wash multiple times, because it is soft because it does not like scratches and dirt on the product is useful. I'm sure to boil it before applying the laminate to the inkjet media so that it won't get dust and hair. Because it is cheap, it will be saved as soon as it gets dirty it will be replaced. With Sums Matinasi, it can be used smoothly when using rubber gloves.